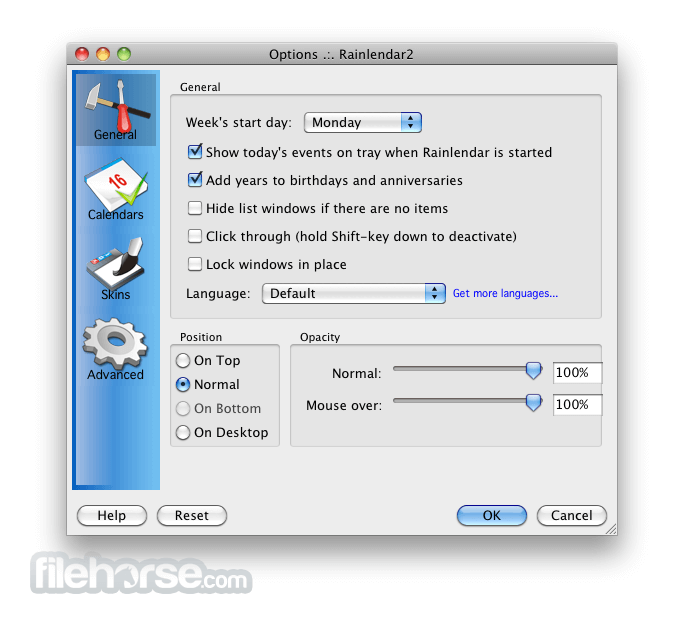 Rainlendar for Mac is a feature rich calendar application that is easy to use and doesn't take much space on your desktop. The application is platform independent so you can run it on all major operating systems: Windows, Linux and Mac OS X. The appearance can be customized with skins and you can even mix different skins together. It is possible to use Rainlendar with other calendar applications too. Rainlendar uses the standard iCalendar format to store its events and tasks so you can easily transfer them between applications. 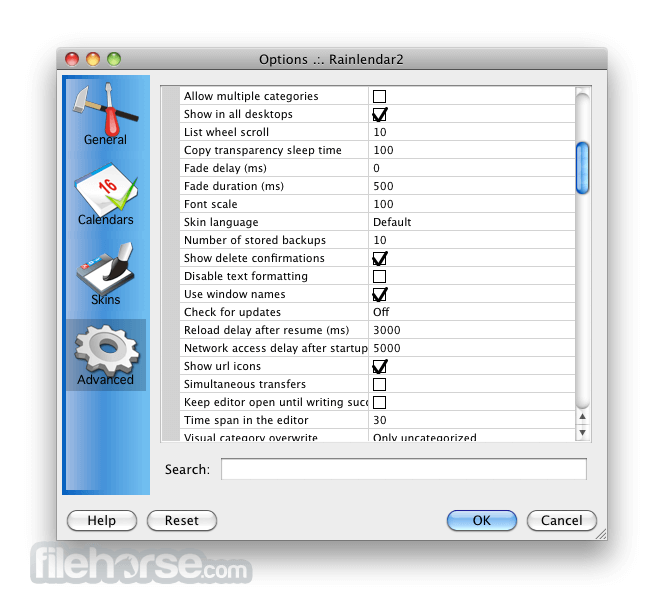 Rainlendar for Mac is a unicode application and supports localization so you can use it in your own language. All the future events are shown in a separate list where you can see the week's events at one glance. You can decide how many days in advance you want to see in the list. Different events can have a different appearance in the list so you can easily spot the important events from the others. The icons in the calendar are also available in the event list and other windows to make it easier to separate the events. You can also have a separate list for your long term tasks. 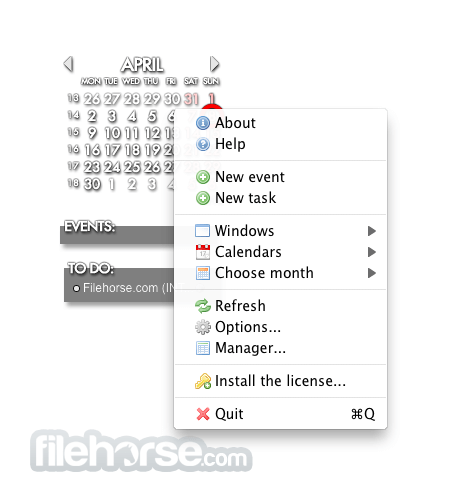 The task list can be arranged several ways so that you can keep it better organized. You can also set a due date for the tasks to make sure you'll remember to do them on time. You'll also get an alarm when an event or task is due so that you don't miss it. The alarm can be defined to be set off any duration before the actual event so you have time to prepare for it. And that's not all. Check the list of features and the gallery for a better overview of all the things Rainlendar for Mac can do. Get notified in advanced before the event is due so that you don't forget your important events. It is also possible to snooze the alarm if you want to get reminded about it later. 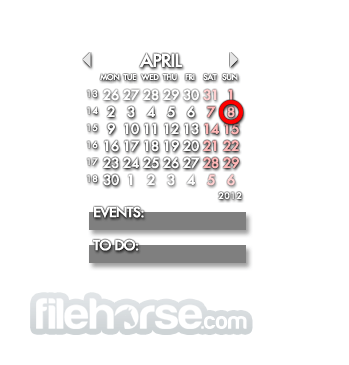 All the data is stored in the standard iCalendar format (RFC2445) which is supported by most calendar applications. This makes it easy to transfer the events between applications. The look and feel of the calendar can be changed with skins. You can also mix the skins together and have as many windows visible as you want. Rainlendar has been translated to over 50 different languages so you can use it in your native language. It's also possible to use any language when entering the events. The application works in all major operating systems: Windows, Mac OS X and Linux. All the data, skins, languages and scripts are the same in all platforms so you can easily migrate between them.